On Jan. 14, 2016, Indonesians woke yet to another terrorist attack in the central business district of Jakarta. It was the latest in a series of attacks stretching back to 2011, when a suicide bomber attacked a mosque. 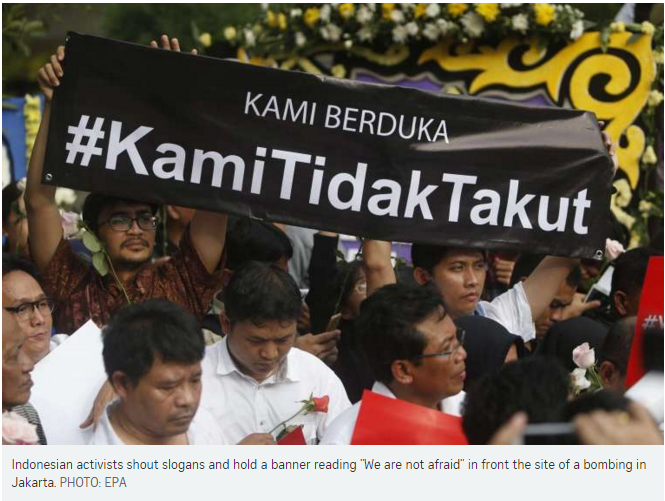 Terrorism incidents like these in Indonesia and Malaysia are primarily caused by the mutual distrust created by differences between religious groups. Given the events unfolding in Iraq and Syria, including Iraqi forces' recent recapture of Ramadi, ISIS may be looking to expand its operations elsewhere, causing it to attack Jakarta. However, many Muslims in Indonesia refuse to identify with the terrorist group's corrupt ideology, and are working to condemn ISIS' proposition of a global Muslim caliphate. Anton Alifandi, a principal analyst for IHS, a global analysis firm, has said that the ideology ISIS is propagating does not appeal to the majority of Muslims living in Indonesia, and that many Muslim organizations have started actively campaigning against ISIS' terrorist activities. One of these organizations, Nahdlatul Ulama (NU), has more than 50 million Muslim members. 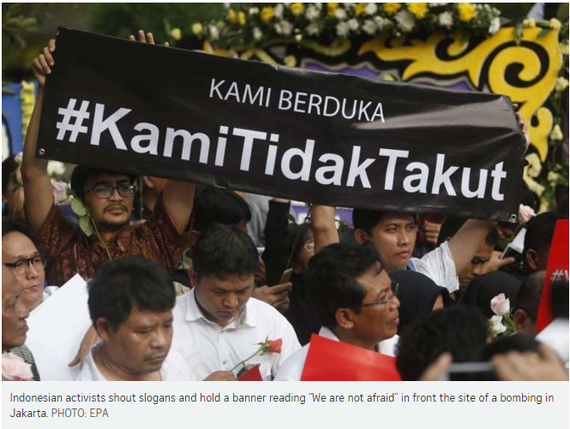 Indonesian Muslims have taken to social media to denounce ISIS using the hashtag #KamiTidakTakut - in English, #WeAreNotAfraid. Southeast Asia has faced multiple terrorist attacks in the recent past, particularly in Indonesia and Malaysia. The Prime Minister of Singapore, Lee Hsien Loong, has called Southeast Asia a "key recruitment area for ISIS," and during the opening of the ASEAN summit in November, the Malaysian Prime Minister, Najib Razak, said that the attacks were propelled by ISIS' religious ideology. The increasing number of both terror threats in Malaysia and successful attacks in Indonesia could imply that ISIS has reinvigorated its terror networks as part of its plan for the region. Indonesia is third largest democracy in the world, harboring more than 250 million people. More than 80 percent of them are Muslims, giving the country the largest Muslim population in the world. This means that ISIS may still have hopes of promoting its ideology there, which would make Indonesia prone to further attacks. However, more European Muslims have joined ISIS than their Indonesian counterparts. ISIS may be having a hard time infiltrating Indonesia, even though it is a primarily Islamic nation. Recently, Malaysia has also received threats of terrorist activity that never materialized. However, with the recent bloodshed in Jakarta, a long-dreaded terrorist attack in Malaysia may be looming nearer. Mohamad Fuzi, Director of the Malaysian Special Forces, confirmed that the terrorists involved in the Jakarta incident made a phone call to a contact in Malaysia before the attack. Malaysian authorities, with the support of Australian and American intelligence, were successful in killing terrorist leaders Azahari Husin and Noordin Mohammad Top in 2005 and 2009, respectively. However, the Syrian conflict has worked to intensify terrorist activity in Southeast Asia - and specifically Malaysia - in many ways. In April of 2015, Malaysian authorities arrested 17 people in Kuala Lumpur on suspicion of plotting terror attacks, and at least 70 members of Malaysia's armed forces were identified by police as having ties to ISIS. The Malaysian government has beefed up security in anticipation of an imminent attack. Tan Sri Khalid Abu Bakar, the Malaysian Inspector General of Police, confirmed Jan. 16 that the police had arrested a suicide bomber who was allegedly on route to detonate a bomb in Kuala Lumpur that day. In the wake of this latest suicide bombing attempt, another similar attack in Malaysia is plausible. Despite the fact that Indonesia has a larger Muslim population, Malaysia could more easily fall into ISIS' hands. A study by the Pew Research Center revealed that eleven percent of Malaysians are sympathetic to ISIS, compared with only four percent of Indonesians. Most Muslims, internationally, do not identify with ISIS ideology. "Malaysians want to be anti-terrorism, and yet they want to have popular support," said Lowell Dittmer, editor of Asian Survey and a political science professor at the University of California, Berkeley. Competition between Malaysian political factions, he said, "makes them all want to say, 'I am more Muslim than you are,' so that pushes the whole electoral competition (towards a) pro-Muslim (extremist) position." Dittmer added that through Malaysia, ISIS wants to expand into the Philippines and Southern Thailand, where many Muslims live. Part of the difficulty in stopping extremism, he said, is that Islam is a widespread religion with no central organization. "People have been saying that (followers of) Islam should come out and combat these violent tendencies," he said, "but how can you form a moderate consensus in Islam against those radical people?" While the fight against Islamic extremism is real and dangerous, there are concerns as to whether the war on terror can be won through military force alone. ISIS uses radicalization as its primary recruitment tool. Directly fighting the ideology propagated by ISIS could be a more efficient way of combating terrorism, since the group cannot maintain a military presence if it cannot persuade new members to join. Terrorist organizations like ISIS use the Islamic faith to justify their ruthless acts. The religious conflict they seek to instigate is the primary cause of terrorism, both in Southeast Asia and in many other parts of the world. But ISIS' beliefs are founded on a ridiculous misunderstanding of Islamic teachings. Many Muslims already disagree with them. It may be necessary to launch combat operations, conduct surveillance and tighten security in areas prone to attack. However, it is possible to win the war on terror by instead advocating the proper teachings of Islam, thereby fighting radicalization within the Muslim community and exposing ISIS' beliefs as lies. As it is written in the Qur'an, "Whoever kills a person [unjustly]...it is as though he has killed all mankind. And whoever saves a life, it is as though he had saved all mankind."